The environment that we construct affects both humans and our natural world in myriad ways. There is a pressing need to create healthy places and to reduce the health threats inherent in places already built. However, there has been little awareness of the adverse effects of what we have constructed-or the positive benefits of well designed built environments. This book provides a far-reaching follow-up to the pathbreaking Urban Sprawl and Public Health, published in 2004. That book sparked a range of inquiries into the connections between constructed environments, particularly cities and suburbs, and the health of residents, especially humans. Since then, numerous studies have extended and refined the book's research and reporting. 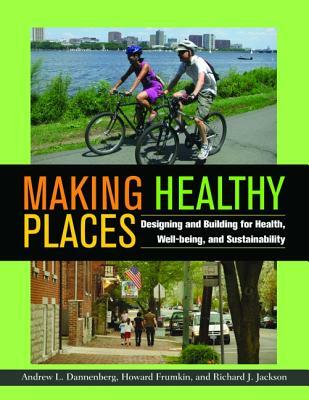 Making Healthy Places offers a fresh and comprehensive look at this vital subject today. There is no other book with the depth, breadth, vision, and accessibility that this book offers. In addition to being of particular interest to undergraduate and graduate students in public health and urban planning, it will be essential reading for public health officials, planners, architects, landscape architects, environmentalists, and all those who care about the design of their communities. Like a well-trained doctor, Making Healthy Places presents a diagnosis of--and offers treatment for--problems related to the built environment. Drawing on the latest scientific evidence, with contributions from experts in a range of fields, it imparts a wealth of practical information, with an emphasis on demonstrated and promising solutions to commonly occurring problems. Howard Frumkin, MD, DrPH, is Dean of the School of Public Health and Professor of Environmental and Occupational Health Sciences at the University of Washington. He previously served as director of the National Center for Environmental Health/Agency for Toxic Substances and Disease Registry at the Centers for Disease Control and Prevention (CDC), where he established programs in climate change and in the built environment. He also served as Special Assistant to the CDC Director for climate change and health. Dr. Frumkin received an MD from the University of Pennsylvania, an MPH and a DrPH from Harvard University, and further internal and occupational medicine training from the University of Pennsylvania, Cambridge Hospital, and Harvard University. He has co-authored two Island Press Books: Urban Sprawl and Public Health and most recently Making Healthy Places: Designing And Building For Health, Well-Being, And Sustainability with Andrew Dannenberg and Richard J. Jackson. His other books include Environmental Health: From Global to Local and Safe and Healthy School Environments. He is also the author or co-author of over 180 scientific journal articles and chapters. He is a fellow of the American College of Physicians, the American College of Occupational and Environmental Medicine, Collegium Ramazzini, and the Royal College of Physicians of Ireland. Richard J. Jackson, MD, MPH, is Professor and Chair of Environmental Health Sciences at the School of Public Health at the University of California, Los Angeles. He is also a faculty member in the departments of Pediatrics, Urban Planning, and the Institute of the Environment and Sustainability at UCLA. A pediatrician and public health leader, he has served as State Health Officer for California and in many other leadership positions in both the environmental health and infectious disease fields. For nine years he was director of the Centers for Disease Control and Prevention's (CDC) National Center for Environmental Health in Atlanta, for which he received the Presidential Distinguished Service award. While in California he helped establish the California Birth Defects Monitoring Program and state and national laws to reduce risks from dangerous pesticides, especially to farm workers and children. While at the CDC, he established the national asthma epidemiology and control program, oversaw the Childhood Lead Poisoning Prevention Program, and instituted the current federal effort to "biomonitor" chemical levels in the U.S. population. In the late 1990s he was the CDC leader in establishing the U.S. National Pharmaceutical Stockpile to prepare for terrorism and other disasters (the stockpile was activated on September 11, 2001). He has received the Breast Cancer Fund's Hero Award, as well as Lifetime Achievement Awards from the Public Health Law Association and New Partners for Smart Growth. He received an MD from the University of California at San Francisco and an MPH from the University of California at Berkeley. Dr. Jackson lectures and speaks on many issues, particularly those related to the built environment and health. He has co-authored two Island Press Books: Urban Sprawl and Public Health and, more recently, Making Healthy Places: Designing and Building for Health, Well-Being, and Sustainability with Andrew L. Dannenberg and Howard Frumkin. He is the narrator of a 2011 PBS special Designing Healthy Communities. He has served on many environmental and health boards, as well as the Board of Directors of the American Institute of Architects. Timothy Beatley is the Teresa Heinz Professor of Sustainable Communities at the School of Architecture at the University of Virginia, where he has taught for over twenty-five years. His primary teaching and research interests are in environmental planning and policy, with special emphasis on coastal and natural hazards planning, environmental values and ethics, and biodiversity conservation. He has published extensively in these areas, including the following books: Ethical Land Use; Habitat Conservation Planning: Endangered Species and Urban Growth; Natural Hazard Mitigation; and An Introduction to Coastal Zone Management. In recent years much of his research and writing has been focused on the subject of sustainable communities, and creative strategies by which cities and towns can reduce their ecological footprints, while at the same time becoming more livable and equitable places. His books that explore these issues include Biophilic Cities, Resilient Cities, and Green Urbanism (Island Press). "It is just about the most authoritative and thorough examination of how our urban design (and house design) affects our health and wellbeing, and should be on the desk of every urban designer and planner as an important reference… I cannot imagine writing about urban issues involving food, health, safety or transportation without picking this up for a quote or a reference; it is going to be an essential tool." "This comprehensive, beautifully edited volume explains why and how our physical environment profoundly affects each of us, our family, our community, and our nation. A treasure of excellent chapters by well-respected experts, it is replete with practical wisdom on how to diagnose and ameliorate the wide range of environmental problems, with inspiring examples of success. Reading it is the equivalent of a top tier graduate level course in practical environmental health." "The authors have crafted an exemplary look at the various components of community design that promote and support health. Through their perspective we see clearly how much community design matters to our health and well-being; and it matters a lot." "The editors of this powerful volume put design squarely in the public health armamentarium. Both a guide and call to action, its well-researched chapters provide a foundation for profound change in design practice and education. The truly beautiful stairway is one that beckons us to use it—the same applies to sidewalks, parks, bike lanes, playgrounds, and public transportation." "Here's a book that mayors, health officials, developers, architects, planners and environmentalists will want to read and keep handy. Dannenberg, Frumkin, and Jackson call for big gains in public health, environmental and economic performance and provide the necessary advice to achieve such a transformation." "Dannenberg ... et al. ...outline the major health issues that relate to the built environment, including physical activity, food, air and water quality, injury, mental health, and social bonds, and specific transportation and land use aspects. They also address how to create change, the future training of professionals, research, and urban health in low and middle-income countries." "The book is an extensive, sometimes exhausting, overview of many related topics. The challenges it presents are sobering. The solutions it envisions are exciting. Landscape architecture is present throughout. Some may find it a "heavy lift" given its length and, in some instances, highly technical nature. But it is all there, providing landscape architects, architects, and planners with tools and strategies to think about how the built environment impacts our physical, mental, social, environmental, and economic well-being." "The book's introduction states it is primarily aimed at students but it would disappointing if this timely research fails to reach other audiences—in particular politicians at all levels of government." "The editors seek to avoid technical jargon that might put off the students to whom the book is addressed." "The thesis is simple. The urban environment should be planned and built to encourage physical exercise, a healthy diet, low pollution levels, accessible nature necounters, and mental serenity." "This book explores how the built environment continues to impact on health (and consequently life chances) and sets out how planners, policy makers, designers and educators can influence this dynamic and engage with the 'perfect storm of intersecting health, environmental, and economic challenges'." "Making Healthy Places, although it is not a theological work, is deeply theological in the vision of health that is seeking and is a book that not only must be read and discussed in churches, we must also allow it to shape our vision of what the mission of the church is in our particular places, and as such it is one of the most significant books that I've read this year!"